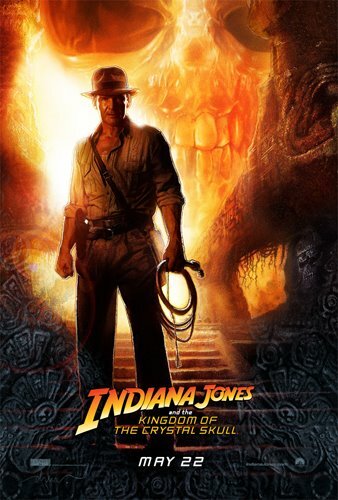 image taken from burbanked.comAbout four years ago I was horrified when my girlfriend at the time mentioned casually how she did not care for any of the Indiana Jones movies. Instead, she preferred the piece of steaming crap we had just finished seeing: Sky Captain and the World of Tomorrow. I knew then that the relationship was doomed to failure. For a generation of sofa-bound adventure types, the Jones movies are the pinnacle of laddish delights. Through them, we travel to a time and place where intellect and two-fisted bravado can coexist, where the good guys are really good, and the bad guys are the worst of the worst. It’s a place where clues are solved with both your brain and your testicles, and where mind, heart and spirit conjoin to produce heroism in its most profound form. Thus, the twenty year wait between the 3rd movie (Indiana Jones and the Last Crusade) and this fourth one promised a return to the purity of that form. In the interim, some of us inspired by Indy have ourselves become adventuring professors who trek through jungles, savannahs and mountaintops in search of strangeness, romance and exotic infections. Well, I’m here to report that the new movie is very enjoyable. But it’s also a great disappointment. Where to start? Yes, Ford (and thus Indy) are now 66 years old. That’s okay. The film even makes a few aging jokes. But given that he’s 66, maybe it’s not so convincing that he’s beating up tough Red Army soldiers half his age? I would have much preferred to have seen an emeritus adventurer directing his little young proteges about. Karen Allen, while ten years younger than Ford, has aged well for an average woman, but poorly for a Hollywood starlet. Sharing a screen with 39 year old Cate Blanchett, who looks fan-freaking-tastic, doesn’t help her much either. But Allen’s role doesn’t call for her to be the hot young thing anymore; it calls for her to be spunky and worthy of Indy’s heroics to save her. Sadly, their supposed re-budding romance just looked more like an episode of the Love Boat. Eww. Then there’s Shia LaBoeuf as Indy’s son. Yes, his son. Why does Indy need a son? Why does Superman need a son? What is with Hollywood and its recent celebration of the absentee father? It’s too cute, too convenient, too trite. The action was way over the top. This was more a video game than an Indy movie. The old Indy crawled under moving vehicles and was bruised and beaten for his efforts. The modern Indy –and his son– straddle speeding jeeps while rapier-dueling, and neither emerges with a bruise. All too convenient. See, there’s a line between campy and stupid, and this movie crosses that line often. Here are three examples: Indy survives a nuclear explosion by hiding in a refrigerator. Read that again. Then his son swings from tree vines like Tarzan, leading his own army of monkeys. Seriously. And –get this– Indy gets pulled out of a sandpit, using a live python as a rope. Stupidity abounds. And lastly….. aliens? Haven’t Lucas and Spielberg given us enough aliens already? Indy has always been about ancient cultures and their connections to indefinable deities. By defining the deities as space aliens, the movie is dragged from mysterious to hokey. Me not like. And don’t get me started on how ridiculously fake that crystal skull looked. Geez Louise. Anyway, colour me disappointed. This could have been a tremendous film, an opportunity to really show how an aging adventurer could hold his own mentally instead of physically, in a changing world that no longer appreciates his style. But no. Instead, we get the Love Boat. At least I still have the terrific TV series, Young Indiana Jones. No aliens show up in that one.